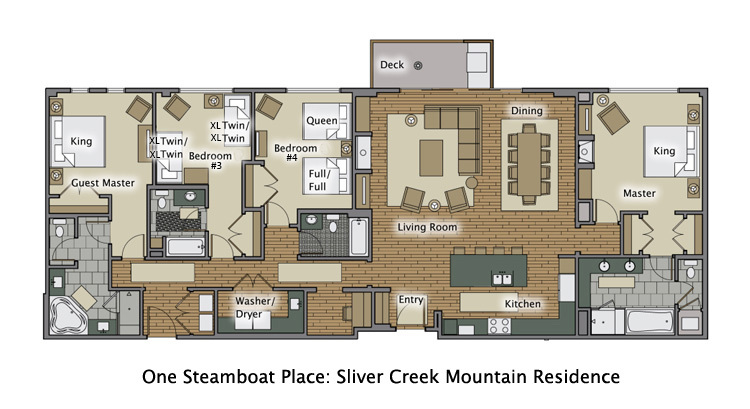 With a slope side view over the Steamboat Ski Mountain, the Silver Creek Mountain Residence at One Steamboat Place is an exceptional 4 bedroom residence with a location and view that is hard to beat. The slope side Private Residences at One Steamboat Place are located in the Gondola Square in Steamboat's Mountain Village. Silver Creek Mountain Residence offers a front row view of the Gondola and the Ski School gathering place - you can watch the Kids Ski School from your balcony! This four bedroom residence offers premier lodging within a world-class resort and spa. The Viking appliances of the professionally equipped kitchen will delight the chef in your group. Or you can use the built-in gas BBQ on the deck for grilling out. The dining area, adjacent yet separate from the living room, will allow you to enjoy relaxed meals just across from the majestic fireplace. The master bedroom sets the mood with a gas fireplace, and the master bath features a steam shower with a rain shower head and Jacuzzi tub. A second bedroom offers a King bed. Bedroom three has a queen bed and a set of twin bunk beds. The 4th bedroom is a perfect kids den with two sets of XL twin bunk beds. All bedrooms have a private bathroom. The view from its deck is stunning as it pans the slope side, the Steamboat Gondola and the Ski Resort. We have been visiting Steamboat for over 10 years from Texas and have stayed on the slopes and off. One Steamboat is unique in that it offers virtual Ski-in-Ski-out convenience with the shops and restaurants around the Gondola area literally at your door. Silver Creek was beautifully appointed and offers a great view of the slopes. Of the other Ski-In-Ski-out places we have stayed, the greatest thing about this condo is how convenient they make renting skis, boots, snowboards etc with the Black Tie service at the base of the condo and the ease of getting around the gondola area. The service from these guys was awesome as they take your skis every day and set them back out anytime you want. If you are comparing to a ski to your door type condo, which we have done, we found the ski service and not having to walk or take a shuttle to the Gondola area a convenience we liked as much or more than the ability to ski in and out of your door vs. the 30 second walk through the Gondola area to the Gondola. When tired, you just ski back directly to the valet service where they take your skis! The shuttle service to downtown and getting groceries offered was also a big plus. The other high-end condos do this but the staff will take all your groceries up to your condo for you and help you unload them as well. A big relief if it is just one of you going to the store. All things considered, this was in the top 2 places we have stayed in Steamboat.